CBS News State Dept. Reporter Charles M. Wolfson offers some thoughts as the White House responds to the shocking news about North Korea's ongoing nuclear program. It seems every Asia expert in Washington, both in and out of government, is busy trying to decipher the latest surprise from North Korea. The acknowledgement earlier this month by North Korean officials that it has an ongoing nuclear weapons program, came as a shock and a surprise, to put it mildly. North Korea's admission that it was going forward with nuclear weapons production was made to James Kelly, Assistant Secretary of State for Asian affairs, who was in Pyongyang early this month. Kelly confronted the North Koreans with evidence the U.S. had obtained. After denying the existence of the ongoing effort at first, the North Koreans quickly changed their mind, and, much to the astonishment of U.S. officials, openly acknowledged the effort to produce highly enriched uranium, which is used in the production of nuclear weapons. By so doing, the North Koreans were admitting they were in violation of the so-called Agreed Framework, a 1994 accord designed to freeze the DPRK's nuclear program. Amb. (ret.) Wendy Sherman, former Secretary of State Madeleine Albright's chief strategist on North Korean issues said "who knows" when asked about Pyongyang's intentions. "It's more important to think about how to go forward," she continued, "to think otherwise is 'unthinkaboutable!!'" Not the normal reaction from diplomats, active or retired, but that's an indication of how shocking this revelation was to Washington and to capitals in Asia. Some analysts see an effort by North Korea to reach out to the Bush administration, which has not been quick to show much interest in dealing with the despotic, dictatorial regime of Kim Jong Il in Pyongyang. Joel Wit, who helped negotiate the Agreed Framework and who has traveled to Pyongyang 15 times for various sets of diplomatic talks, says he is not surprised that they were engaged in such a program, in violation of the negotiated agreement, but he is surprised they admitted it. "Their defiant posture is in character when they feel their backs are to the wall," says Wit, now an analyst for the Center for Strategic and International Studies in Washington. But it can also be seen, he argues, as an attempt "to grab the Bush administration by the lapels and say, 'hey, let's have a dialogue.'" 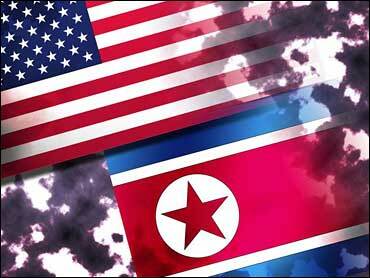 So, yes, there is both anger and reaching out involved in Pyongyang's calculations. "Sometimes," Wit says, "North Koreans use threats to communicate." Meanwhile, senior Bush administration officials are treating this admission by a charter member of the "axis of evil" club (Iran and Iraq are the other members) very gingerly. Secretary Powell, asked if any plans were afoot to take military action against North Korea as with Iraq, said there were no such plans now. Every signal from official Washington has been to let the situation cool down and somehow start a dialogue aimed at defusing the situation without a military confrontation. Because North Korea has a million men under arms on its border with South Korea and because the U.S. has 37,000 of its own troops stationed along that border, it's easy to see why Wendy Sherman calls any alternative to dialogue "unthinkaboutable." Many analysts like former Assistant Secreatry of State Robert Einhorn, who has also spent many hours negotiating proliferation issues with North Koreans, note Pyongyang's efforts at reaching out to its neighbors in Asia. Recent overtures to both Japan and South Korea had led most to believe Kim Jong Il hoped to reach out and resolve differences peacefully. Now, there is confusion in Tokyo, Seoul, Beijing and Moscow and senior U.S. officials are visiting those capitals, everyone trying to figure out where this is going, and how the U.S. and its allies can work together on a coordinated strategy. As Joel Wit says, the Bush administration needs to understand "there are no good options and it has to choose the least worst—which is dialogue, not sanctions, or not cutting them off and isolating them." Early indications are Mr. Bush, Secretary Powell and Secretary of Defense Rumsfeld do understand. They also clearly know the last thing they need now, as the America embarks on a strategy with Iraq that very well might lead to war, is another super-heated, military confrontation with a rogue state which may already have one or two nuclear weapons.